If this picture doesn't make you want to check out the photo series Wiener Dog Races, there's something wrong with you. Or at least something different from me. 19 adorable pictures. Hat tip to Sister Carlye. Gracias. My colleague (and, um, girlfriend) is blogging again over at Miss Bee. She apologizes for the long wait. See her new post here. To whet your appetite for elementary education, here's a quick anecdote. After school there's a madhouse of children going for cars lined up in the fire lane, walking home, self-immolating, etc. So the other day, one of Miss B's kids is being directed by his former kindergarten teacher to go to the car by me. Ms. Kinder: "Saul, your car's over there. By Mr. S."
Saul: "That's not Mr. S. That's BRET!" Same kid who cut a milk carton in half the day after Earth Day and wore it on top of his head like some kind of robot space cadet. So a line was dropped unto me, and now the second mix will be dropped unto you. Tracklisting in the above photo, if you can't read it click on the pic and it should be big enough. Divshare has apparently taken away the embed function that would allow you to stream it, so I guess it's a full download. Let me know of any tech problems, I can always email it directly to you with Divshare. For the Pickle's Picks, Vol. 2: G-R, click here. So at this point I've received mixed (ranging from ambivalent to negative, actually) reviews of my previous musical posts. First I tried the "Superstar Who Dominates Their Field" conceit, which I feel either went over the head of or was uninteresting to the audience (and a lot of work). There were a few posts with just a song or two; it's hard to know where to take that idea...I could post a song a day for years, just making myself happy. Then I tried the "Make a Mix; Compress It; Upload It"tack which was met with critical, familial, and friendly silence (I have three more to go here, folks). It takes forever to upload one of those mixes, so if anyone actually downloaded "Pickled Soul, Vol. 1" (still available here) and enjoyed it, let me know. There are two more to finish the alphabet, and a special hits collection I call "Pickle's Picks". 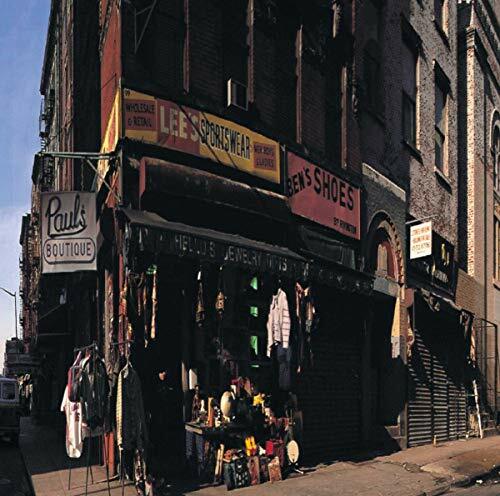 Anyhow, my new music concept is a beat deconstruction of the Beastie Boys' "Paul's Boutique" album, produced by the Dust Brothers. Every song on the album has at least one high-profile sample; most of them have several. Since I own and really enjoy many of the songs, I've decided to post a few, song by song, going through the album. This should demonstrate the eclecticism of the Boys and the Brothers, give me something to do, and do some early hip-hop education. For more information about "Paul's Boutique", hit up All Music Guide or This Guy's Page. I prefer to use this method as "blogging-of-last-resort" but I've seen some extremely interesting things on the internet recently. Two things make tall buildings possible: the steel frame and the safety elevator. The elevator, underrated and overlooked, is to the city what paper is to reading and gunpowder is to war. Without the elevator, there would be no verticality, no density, and, without these, none of the urban advantages of energy efficiency, economic productivity, and cultural ferment. The population of the earth would ooze out over its surface, like an oil slick, and we would spend even more time stuck in traffic or on trains, traversing a vast carapace of concrete. And the elevator is energy-efficient—the counterweight does a great deal of the work, and the new systems these days regenerate electricity. The elevator is a hybrid, by design. While anthems have been written to jet travel, locomotives, and the lure of the open road, the poetry of vertical transportation is scant. What is there to say, besides that it goes up and down? That's from a New Yorker piece called Up and Then Down. Check it out. Another N.Y. piece from a while ago by the esteemed Malcolm Gladwell: The Ketchup Conundrum. Who knew this condiment had such an interesting history? ¿Qué mas? Here's a link for the "50 Greatest Comedy Sketches of All Time", which so far we've found to be very spotty but probably worth your time. Avoid #49. Finally, I really enjoyed this little article about typographical errors. Maybe that's just me. Nothing doing here these days. No good pictures, lots of work. Anyways, I've created an online album dedicated to the autistic kids I worked with before. Hannah: She and Alfred are six-ish. Anthony: 4th grade for reading class and PE! For a few more pictures, almost all of Alfred, head on over to my Picasa. This item popped up in my RSS feed reader today and states pretty much what I think. I'm not always in line with Matt Iglesias, and the Quiggin piece is online here at Crooked Timber, an econ blog I don't read at all. "Far more losers than winners" indeed. Also, the other hyperlink in the article was for the Wikipedia page for something called "Godwin's Law", which introduced me to the logical fallacy they call Reductio ad Hitlerum which I find hilarious.